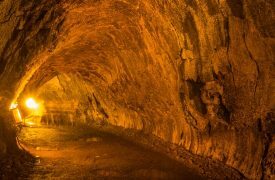 One of the most memorable and fascinating activities to seek out on your Big Island adventure doesn’t take you far from the comforts of Kailua-Kona, but you’ll feel as though you’ve been transported to another place and time. 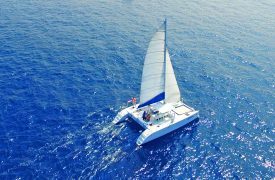 Swimming, diving, and snorkeling with the manta rays off the Big Island coast is a remarkable activity you can enjoy with your family or friends, making memories that will last a lifetime. The manta rays native to the waters of Hawaii are of the Manta alfredi species, the second largest in the world. 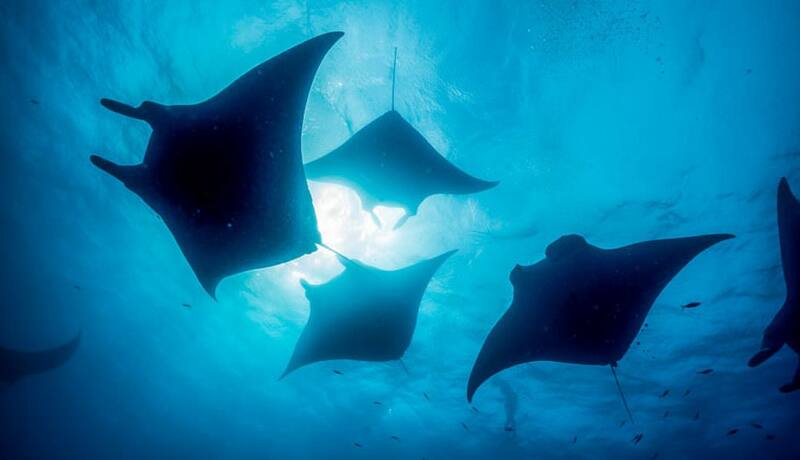 While their wingspans can reach up to 18 feet, most manta rays around Kona average between 10-12 feet in wingspan. The rays are incredibly graceful and gentle and watching them swim is more like watching a bird in flight than a marine animal swimming. Surviving on a diet of mostly plankton, Kona manta rays feed with their mouths wide open and reside in the coastal waters around the islands for the entirety of their lives. Because they live to be nearly 50 years old and return regularly to the same locations, many of the manta rays in Hawaii have been given their own names. Few other places in the world make viewing manta rays up close so easy and accessible, but only Hawaii allows you to experience the rays at night, while they feed. Several locations on the Kona side of the Big Island allow for manta ray viewing and activities, but so-called ray bay is the hotspot. 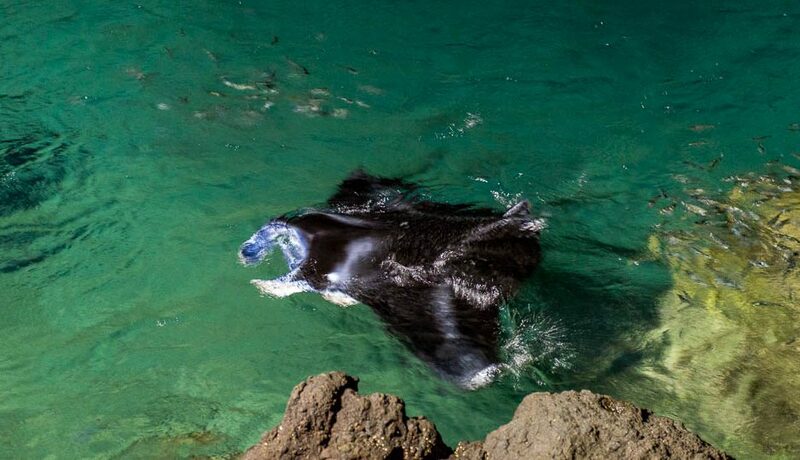 Directly below the Sheraton Kona Resort at Keauhou, these manta rays are often attracted to the plankton that moves near the surface as the resorts spotlights turn on and the sun begins to set. Visitors to the resort can watch the rays feed from the resort’s viewing platform, but for an up-close experience, getting in the water with these amazing animals is the best option. Thankfully, visitors have plenty of options based on price, availability, and timing to see the manta rays. Whether you want to splurge and experience the animals up close or relax and watch them feed from a nearby viewing platform, options are available that suit both your time and bank account. 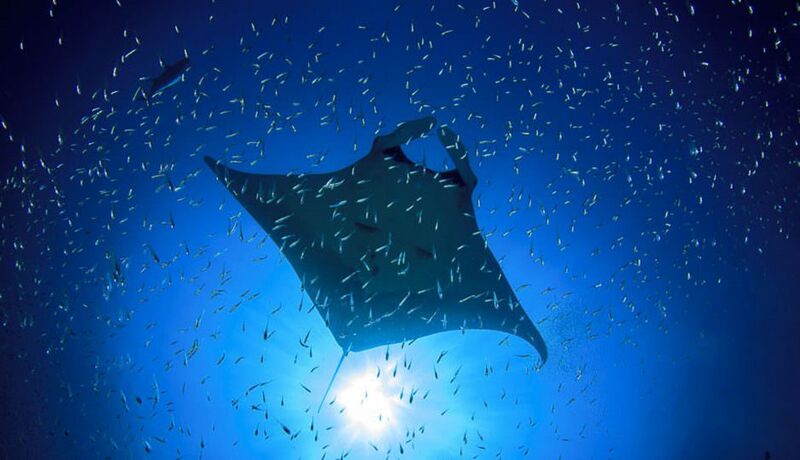 Most manta ray snorkeling trips include a guided tour to the location, gear, and floatation devices. 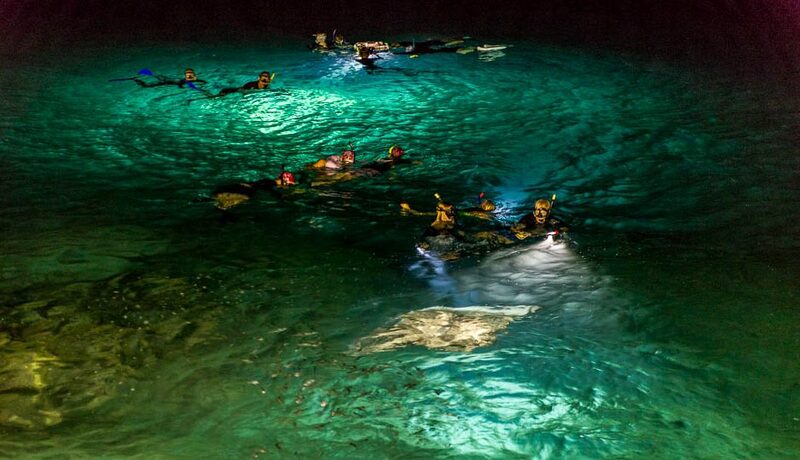 You’ll be looking at the rays while as they feed, illuminated by nearby spotlights and viewing lights projected by the tour boat. You will be looking down into the water, wearing snorkel gear and holding on to a floating platform with handles. Because plankton are attracted to these bright lights, you’ll be awarded a unique perspective to see the manta rays feeding up close without venturing too far from the boat. If the tour boat is crowded, the experience can be overwhelming for people who are claustrophobic or uncomfortable in snorkel gear. While this option is restricted to certified scuba divers, there are plenty of options for those who meet that requirement. Whereas tours and snorkeling have you looking down from above on the animals as they feed, diving provides the unique perspective of seeing the rays from below. If you’re not a certified diver and wish to become one before or during your trip, check out our guide to becoming scuba certified. 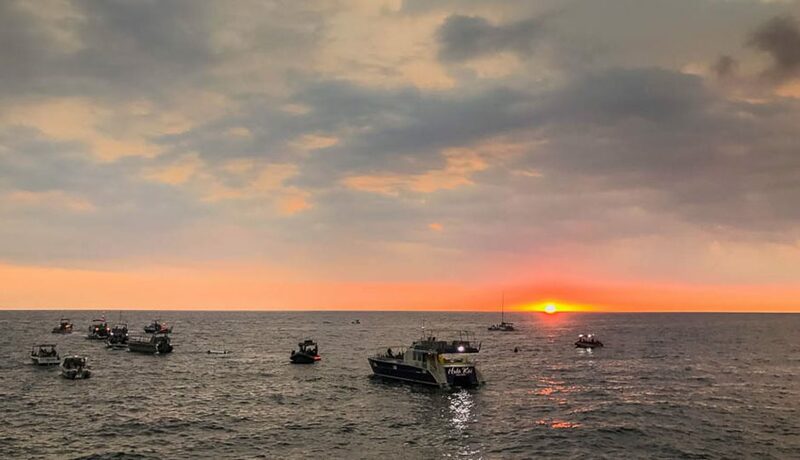 If you’re not inclined to see the manta rays from the water but still want to get a good view, some tours offer bottomless boat tours that provide an illuminated view of the ocean floor, where manta rays feed on the plankton attracted by the bright lights of the boats and harbor. Another option for the thrifty tourist is to catch a glimpse of the manta rays of Keauhou Bay from the viewing platform at the Sheraton Kona Resort. You don’t need to be a guest of the resort to show up and watch the manta rays, but the best view will be from the deck of Rays on the Bay, so plan to stop in for an appetizer or cocktail and stay for the amazing view. What if no manta rays appear on the night I’ve booked my tour? It’s standard practice for tour companies to rebook your manta ray tour free of charge if no manta rays show up on your scheduled night. While it’s very common that the rays appear on a nightly basis, it’s impossible to guarantee their appearance. That’s why it’s wise to book your tour early in your Big Island adventure so you can plan ahead if your manta ray viewing night has to be rescheduled. 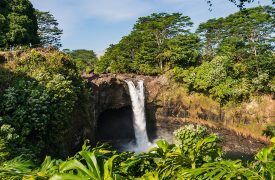 If you’re visiting the Kohala Area, there are many state and national parks you should see to gain a taste of Hawaii’s culture and unique natural wonders.